The Championships Wimbledon…the grass, tennis whites, the All England Club, strawberries and cream, royalty…what’s not to love about the oldest tennis tournament in the world, and arguably, the most prestigious?? Not up for debate is that obtaining Wimbledon tickets is only slightly less difficult than winning the Grand Slam. In the tennis community, winning The Championships, Wimbledon is a greater honor than earning an Olympic gold medal. Traditionally, Wimbledon enforces a strict dress code, requiring players to be dressed entirely in white and it is not uncommon for them to be asked to change prior to their match. Whether you come for the game, celebrity and royalty spotting, strawberries and Pimm’s, to see London’s famous attractions or any number of other reasons, the All England Lawn Tennis and Croquet Club makes the top of any tennis fan’s must-see bucket list! Reserving your seats at Wimbledon can be a challenge, much like acing a 120 mph serve. Here we cover reserved and paid tickets, as well as free and last minute options. What you get and how much you pay will largely depend on how much you are willing to leave to chance vs having a guaranteed spot on your date choice. Ticket Resellers – Our recommended reseller site is StubHub. 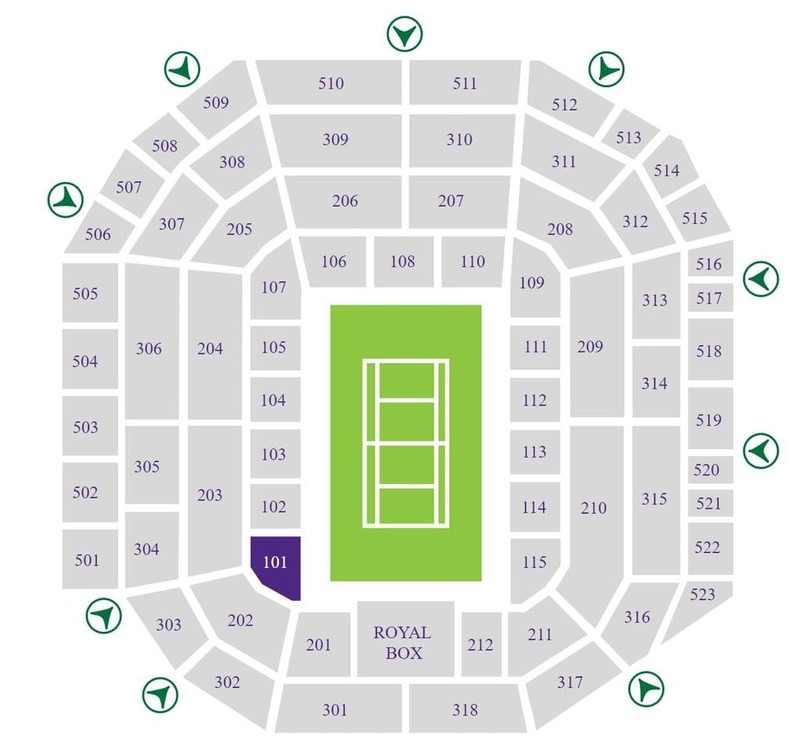 While reseller sites are not "officially" approved by Wimbledon, they do allow those who REALLY want to watch an opportunity to buy tickets in advance for their specific date, time and match. Our recommended resellers are VERY reputable companies, with excellent customer service and 100% guaranteed tickets. The Public Ballot allows you to place your name in the draw for tickets and if chosen, you may buy them at face value. You may not request specific courts, dates or matches, as they are chosen randomly by a computer. The two ballots, overseas and UK, are free to join and if you are chosen, Wimbledon will contact you with a window to purchase tickets. The UK ballot is open September through December and notifications are ongoing from February through the early rounds of the tournament. The Overseas ballot is usually open during the first two weeks in December and notifications start in January. Enter at www.wimbledon.com. Wimbledon Tickets at Ticketmaster – Primary Official Seller. Several hundred Centre Court and No.3 Court tickets are sold online the day before each match throughout the early part of the tournament. The Queue – A limited number of tickets are available daily for Centre Court, No.1 and No.2 Courts on the early days of the tournament (not the last 4 days). There is one Queue for the on-day sale of tickets at the Gate 3 turnstiles, one per person, cash only. Bring your overnight camping equipment – The Queue is not for the mild tennis fan. Final-set tiebreakers – Following the 26–24 final set (six-hour, 36-minute semi-final match) between John Isner and Kevin Anderson, Wimbledon has decided to introduce a final-set tie-break. Starting in 2019, the tiebreak will be played if the score reaches 12–12 (and 6-6 in the 3rd set, for Ladies). Wimbledon joins the US Open as the second Grand Slam to use a final-set decider. Retractable Roofs – No more rain delays. As of 2019, both Centre Court and Court No. 1 have retractable roofs, so book your tickets with 100% confidence all matches will proceed as scheduled. If you prefer to stay around the tennis site, then stay at one of the properties at Wimbledon district. Hotel du Vin Cannizaro House Wimbledon – 18th century luxurious boutique hotel, offering upscale accommodations just next to the famous tennis courts! Tip: Do not enter anything in the “Where are you going” field – just enter your dates. The yellow marker represents, "All England Lawn Tennis Club (AELTC), Grand Drive, London, UK." To zoom out and see more hotels, click the dash in the lower right corner 2 times. If this is your first time in London, and you prefer to stay in the Heart of City, closer to the well-known sites such as Hyde Park, Buckingham Palace, London Eye, Madame Tussauds Museum, Big Ben, and famous shopping at Oxford Street, select one of the top picks in London – 5-star The Marble Arch London; the spacious & elegant St. James’ Court, A Taj Hotel; affordable Hampton by Hilton London Waterloo, or DoubleTree by Hilton London Kingston Upon Thames. When visiting Championships Wimbledon, it is highly recommended to take advantage of a well-developed public transportation system. It does not matter where in the city are you located, as the Transport for London Journey Planner combines tram, train, tube and bus, and will help you to find a right way to All England Lawn Tennis and Croquet Club! Wimbledon is played on the 18 grass courts of The All England Lawn Tennis and Croquet Club. Centre Court, the world’s most famous tennis court, offers 14,979 viewing seats, a retractable roof and is used only during the Championship every year. It is not uncommon to see the Royal Family seated in the Royal Box of the Centre Court, enjoying some of the best tennis in the world. Also, don’t forget to grab some fresh English Strawberries (28,000 kg consumed annually during the tournament) with cream on your way to the crowd, or enjoy traditional afternoon English Tea between the matches. Make sure to explore London and catch the changing of the guard outside Buckingham Palace, experience famous suspension Tower Bridge over River Thames and grab a traditional English Breakfast!